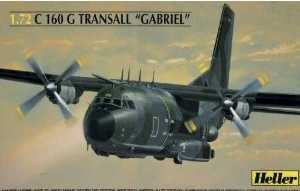 YellowAirplane.com: C-160 Transall Models, C-160 Models, Plastic Model Kits. C-160 Transall Models, C-160 Models. 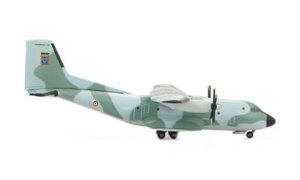 The C-160 Transall Cargo / Air Transport diecast model airplanes, plastic model kits and aircraft books. 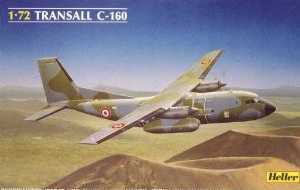 The Transall C-160 is a military transport aircraft developed by French and German aircraft manufacturers for the air forces of those two nations and that of Turkey and South Africa. Product Description 1-72 Scale. New tooling! Measures 18 inches long with a win span of 22 inches. features recessed panel lines, internal ribbed structure in tail section, seats and stretcher stands, detailed cockpit with four seats, detailed nose wheel and landng gear bay, super decals for german and french versions. Skill level 2. 1-72 Scale. Highly detailed kit by Heller complete with instructions and decals. Skill level 2. Herpe releases its first Transall model in the 1/500 scale in the colors of the German Federal Armed Forces air transport squadron. The original of this mold novelty is the C-160D with the registration 50 - 29. For over 40 years Tranalls have been working for the Federal Armed Forces and their well-deserved retirement is still far off due to delays in the Airbus A400M project. This is a 1:500 scale die-cast model airplane from Herpa Wings of the C-160 aircraft in the colors of the Frech Air Force Et 2/64 Anjou. Herpa Wings creates their aircraft models in great detail at their design center in Germany. This is one of the most popular airplane model lines in the world and we are proud to carry the entire line including many rare and hard to find aircraft. Herpa Wings goes to great lengths to ensure an accurate miniature model of the real airplane and the results are impressive at such a great . This airplane model is brand new and in the original box. 1-72 Scale. This kit features 53 pieces and measures about 18 inches long when complete, detailed instructions and decals. Skill level 2. This Transall C-160 of the freight company Xmas Xpress is the Herpa Wings 2008 special Christmas airplane model. With a payload of 16 tons, the original would have the load capacity for many, heavy Christmas presents, but Santa Claus would hardly exchange his loyal reindeer sled for a military transporter. So the model will most likely remain a fantasy model for good.